The history of felt is far older than weaving, going back to the Uighur period in Central Asia and to the Hittites in Anatolia. Relief carvings found at the Hittite cities of Bogazköy and Yazilikaya depict people wearing felt caps and clothes, and fragments of felt dating from the 4th or 5th century BC was discovered at Pazirik in Central Asia, showing that the ancient Turks had also known how to make felt. On the evidence of findings in tombs archaeologists know that felt played an important part in the lives of the Scythians, Sarmatians and Malkars of Karaçay. The Türkmens traditionally lived in tents made of white and black felt symbolizing wealth and poverty, and the Kazakhs lived in felt tents known as kiyiz üy. 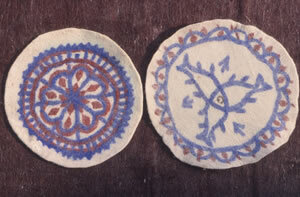 Felt is variously known throughout the region as kidhiz, kidiz, kiz, kiiz and kiyiz. 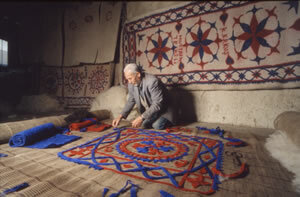 Felt making was widespread among the Seljuk and Ottoman Turks, and these craftsmen played an important role in the mystic trade organizations known as ahi. The uncle of the famous 13th century mystic Haci Bektas Veli was Keçeci Baba (Father of the Felt Makers), who lived in the village of Keçeci in the district of Erbaa in Tokat. Although felt is mainly made by machine today, some continues to be made by hand in parts of Turkey. . The last remaining felt makers are to be found in such Turkish provinces as Afyon, Sanliurfa, Konya, Balikesir, Izmir, Kars and Erzurum. One of their most interesting products is the stiff felt cloak known as kepenek worn by shepherds. These distinctive garments protect the wearer from heat in summer and from cold and wet in winter. 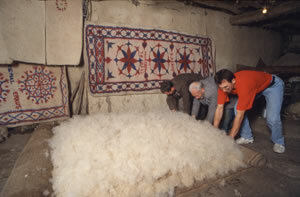 Indoors, plain felt blankets made of white wool are spread over cushions for sitting on in winter, and felt mats are laid over both seats and beds. Colourfully embroidered felt saddle cloths are spread beneath horses saddles to soak up the sweat. Felt was once an indispensable part of daily life, also used to make saddle bags, shoes, headgear, mats, prayer rugs, and many other garments and household objects in various colors. In the eastern province of Agri you can still see men wearing the traditional kullik, a conical brown or white felt cap made from lamb’s wool. . In the neighboring province of Erzurum similar red caps are worn in the villages, and in the northwestern province of Kirklareli you will come across men wearing maroon felt fezzes. In Hakkâri in southeast Turkey people wear slippers known as refik, harik or herik, sewn from layers of felt and wool. In the villages of Trabzon elderly women wear fez-like caps made of dark red felt. 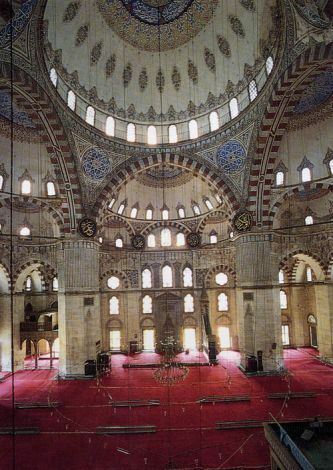 Perhaps the most famous felt garments of all are the tall conical caps called sikke worn by the Mevlevi dervishes, which are made in the city of Konya by Mehmet Girgiç, and sold not only in Turkey, but all over the world. You can visit the TCF Who's Who website to read felt makers' and artists' profiles.